I woke at 6:30 AM and again at 8:30 but went back to sleep until 1:00 PM and I got up at 2. We got packed and I skipped running here to wait for later. Our Accor Favorite Guest card allowed us late check out and we checked out of the Sofitel at 3:30 pm. We had the car loaded by 4:15 and we were heading to Vienna, Austria because I had a course to give at the combined meeting of the American Academy of Ophthalmology (AAO) and the Society of European Ophthalmology (SOE.) Since we had a leeway of one day I decided to drive to the mountain area in southwestern tip of Germany and visit the famous town of Berchtesgaden. Marcia drove the 101 miles and we arrived at 6 PM so it only took us 1:45. 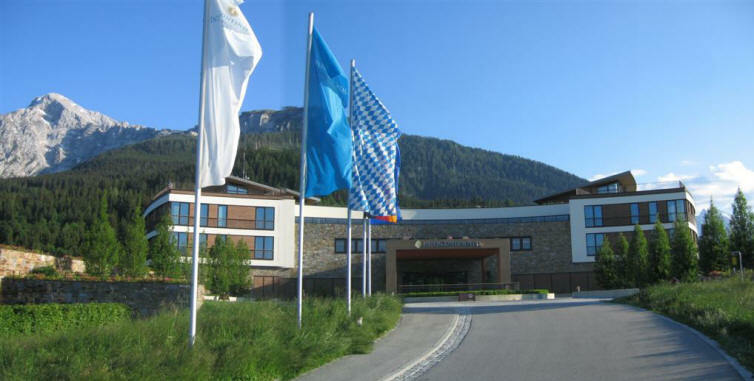 We checked into the Berchtesgaden Intercontinental Hotel [Hintereck 1, 83471, +49-8652-97-55-5243] which I had booked back in Munich. We were surprised by their unusual check in desk which wasn't the usual counter you stand for the entire process but rather a normal desk where Marcia and I each had a comfortable chair to sit in during the entire registration process. It was lovely. The hotel is way out of the town up in the mountains. Left is a stock aerial photo of the town. I would have preferred to stay in the center of town rather than be isolated in some resort, but this didn't turn out too bad. Below is the hotel. Below is a PhotoStitch panoramic view from the hotel of the mountain range. This area is a German National Park. We got to our room and unpacked and I changed immediately to go run. Marcia wanted to relax her back a little because it was still bothering her. The bathroom was very nice (below left) as were the hallways (right) which curved due to the circular shape of the building. Here you see the mountain behind the hotel (below left) and on the right is the mockup model of the hotel and grounds. They had a beautiful spa and pool (below left) and by 7:15, I did my run on their treadmill. Afterward I had a nice cappuccino in the spa. 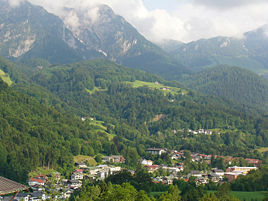 In 1995, 50 years after the end of World War II and 5 years after German reunification, the US Armed Forces Recreation Center Berchtesgaden was turned over to Bavaria (to decrease military spending.) The General Walker Hotel, built by our military, was demolished shortly thereafter. Its ruins, along with the remnants of the Berghof, were removed in 1996 to make room for a new bus depot serving the bus line to the Eagle's Nest and for the new hotel which we are staying at. Nearby, at the top of mount Kehlstein (6,017 ft/1,834 m) you can visit the Eagle's Nest (Kehlsteinhaus), which occupies one of the most breathtakingly scenic spots in Germany. That lodge was headquarters for Hitler's Nazi government (you saw in the old newsreels) and contains a museum and a restaurant today. 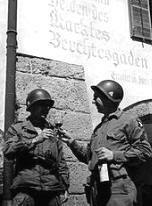 Left is photo of US troops celebrating conquering it in 1945. We wouldn't have time to go there unfortunately. Maybe when we come back to Germany later. After changing, we took the car and at 8:30 I drove to the town of Berchtesgaden. We drove around and it looked like this town was either very small or we hadn't found the center. We decided not to drive around all night once we found the place that was recommended. We arrived at the Hofbrauhaus Braustϋbl but couldn't seem to find the entrance. We kept walking for over a block and finally found it. Note the city's coat of arms. Inside there is a rather informal deli feel to the place and you can look at what you may want to order. At 8:45p we were seated for dinner at an outside table in the courtyard which was very nice. The weather was balmy and it was lovely. I decided to try the beer they brew here called Bräustuberl bier in a nice ceramic stein while Marcia had a glass of weisswine (white wine.) The beer stein-shaped menu sits to the right. For dinner Marcia had a salat and then wienerschnitzle with boiled potatoes. I started out with an appetizer of weisswurst with sauerkraut and potatoes and a main course of Kesselgulash with knudle and salat. The whole meal was fantastic and we were well sated. The whole thing cost us €50. We sat around for a little while enjoying the ambience and at 10:45 PM I drove us back to the hotel. Below is a stock photo of the area in the winter. We got back to the hotel at 11:00 PM and we decided to visit their bar called the Rocks American Bar for a glass of Prosecco and an Amaretto. At 11:30 PM I was able to get free WiFi so I did my AOL email and sent the kids our German phone numbers. I gave up and went to bed at 12:30 AM.